Clancy is the country’s only known mercury smelling dog. 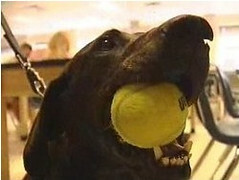 He and his owner roam around the hallways of Minnesota schools sniffing out the culprit. Around 40% of the schools that they visit have had some mercury detection usually due to a mercury spill in the plumbing. When Clancy finds mercury, he receives a treat. Clancy and his owner say that they are safe from the mercury because they get in and out of there quickly and are checked for mercury poisoning on a regular basis. This entry was posted on Monday, May 7th, 2007 at 3:54 am	and is filed under Dogs, National Dog, Cat & Pet Info, News for Cats, Dogs & Owners. You can follow any responses to this entry through the RSS 2.0 feed. Both comments and pings are currently closed.